Sloan’s Ballroom, a rainy Thursday night in January and author Christopher Brookmyre has the Grand Ballroom packed out, with people eagerly awaiting the launch of his keenly-awaited new novel, “Black Widow.” Only a year after the return of reader’s favourite journalist Jack Parlabane in “Dead Girl Walking” Brookmyre is launching the follow up to it, and it’s a moment many have been waiting for. It was immediately evident that the evening was going to be off to a good start, as I spotted author Mark Billingham lurking up the back of the crowd. 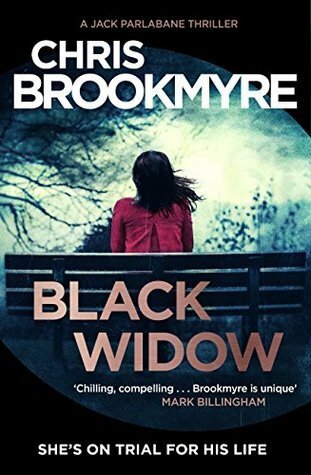 Brookmyre appeared behind the microphone, and the room fell silent. Any kind of book event is always quite odd; it’s a very different atmosphere from a concert or a comedy gig, but it’s always lovely to see someone speak so passionately about something that they’ve obviously invested a lot of time and energy in. Listening to Christopher Brookmyre speak, however, is an absolute joy- often self deprecating, always witty, he delivers one liners with comfortable ease and keeps the audience captured for the duration. The event started with Brookmyre reading from a selection of amusing emails he has received through the years, before challenging the audience to a game of “expletive count” where we had to guess how many times certain rude words appeared throughout his works. After that, he progressed on to a reading from his new book, the excellent “Black Widow.” The reading was from the opening chapter of the book, and the audience were immediately hooked, after which he followed it up by opening the floor to questions. Answering all the questions with his usual aplomb, he then treated to the audience to what is often my favourite part of seeing Brookmyre speak- his famed Kelvingrove bandstand story. Commissioned for the reopening of the Bandstand at Kelvingrove Park, the story is one about a group of school children attending a Shakespeare play; I won’t say any more than that, in case anyone else should attend any of his future events, but it’s always guaranteed to raise a laugh from the attendees!